Just because you can’t comprehend something doesn’t mean you’ll trust that it’s real. We might not be aware of it, but our brains, even if they can’t understand a particular language, have an innate understanding of what a language is supposed to sound like. And when we watch films with poorly crafted fake languages, it’s like watching bad CGI. It pulls us out of the story, reveals the mechanisms that should be hidden by a swift flick of the magician’s sleeve. David J. Peterson found his wonky career path young, after experiencing just such a moment of derailed belief—a disconnect between the subtitles of Princess Leia’s conversation with Jabba in Return of the Jedi, and what was coming out of her mouth. That pre-teen revelation led to a career spent creating, or developing, languages for Game of Thrones, Thor and Defiance, among others. But his work doesn’t exist in a vaccuum—he came up through a vital community of language creators. 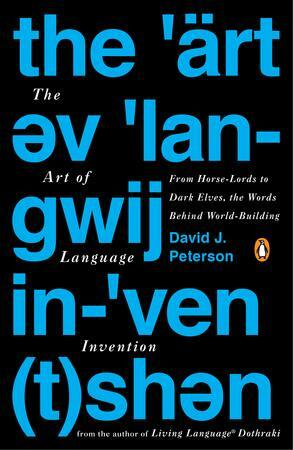 His most recent book, The Art of Language Invention, is a fascinating look at what it means to create fictional languages that feel natural in the mouths of lords and gods, but it also delves into the subculture and history of language creation. Haley Cullingham: In the book, you mention that there are certain sounds you left out of the Dothraki language, sounds you don’t like. You talk about your sensitivity to sounds, and that there are certain letters that you hate. Are you more sensitive to sound than most of the people you meet? David J. Peterson: I never thought of that. I always thought everybody had sounds they just preferred. Consonant clusters that they just preferred. I thought that everybody had that. Do you not have any sounds that you don’t like? I have sounds that I do like. I have favourite words, but I don’t have any words that I hate to hear said out loud. I know lots of people have their things, the word “moist.” But it goes the other way for me. Yeah. Our relationship to sound, especially sounds in language, is always a little odd. Something can trigger some sort of reaction in you, or you’ll have some sort of association with certain words or sounds, or the way somebody speaks, and suddenly it covers you for the rest of your life and you have no idea why. Are there aesthetic groupings of conlangs11“The consensus term for a created language.” ? When you were starting out in language creation, did you find yourself drawn to other people who were creating languages that used sounds that you preferred? I don’t think so. I doubt you’d be able to get a group together, because you know what would happen? It would be like three or four people, they would get together, we’d start putting out a language or having a discussion, and immediately there would be some sort of disagreement. ‘Wait a minute, wait a minute, you like that one too? I can’t stand that sound!’ For the most part, though, usually those aren’t really considerations. Or they’re not things that you steer clear of or stay away from. It’s just a little bizarre note, a fact about your personality. In the case of Dothraki though, I think that one of my ideas in getting rid of certain sounds was to ensure that it had a very different sound to it. So the fact that, if you just hear random English or random bits of most languages, you’re going to come across certain sounds every so often, like p or d or like a oo sound. One of the ways to give your language a very unique sound is to remove some common sounds that you hear in language after language after language. And then their absence becomes sort of noticeable, and changes the character of it. One thing you mention in the book about Dothraki was that translating it has become second nature to you. I’m curious about that idea of fluency in a language you’ve either created, or fleshed out from a fictional source. How often does that shift occur, and does the language feel more alive when it does? Does it change your relationship to it once you’ve shifted into that level of ease? I’m certainly not fluent in Dothraki, certainly not. I do know the grammar forwards and backwards, and I probably have a larger cache of vocabulary that I can recall without looking it up from Dothraki than from most of the other languages I’ve created. But having met somebody who is truly fluent in their language … I attended an amazing talk at the last Language Creation Conference in England, where Jim Hopkins, a language creator from New York, gave an entire forty-minute talk in his language that he had created, Idlani. And then his very good friend, Tony Harris, he was from Vermont, he’s fluent in his own language, but he’s also learned Jim Hopkins’s language. So what happened during the talk is that Jim Hopkins spoke in his conlang, in Idlani, and Tony Harris listened to him and translated it into English for the audience. I had never seen or even imagined something like that for a created language. So I have seen fluency in a conlang, and I know what it means, and I know I’m not there. [Laughs] But the road to fluency, it starts out where I’m at I guess, and you’ll know this feeling any time you study a second language, where you’ll get to a point where you start reading a lot of stuff and understanding without going to the dictionary, and when you translate, you know the grammar, so you know how to say everything you want to say, but then at certain points in time you come to a word that you just don’t know, and so you have to look it up. And in the case of a created language, you either come to a word that you don’t know and you have to look it up, or you come to a word that you don’t have, and so you have to figure out how to realize that concept in your language. Is there a dream application, use for or manifestation of a language you’ve created? I think there are a lot of different goals and different dreams depending on the language creator. Three of them have certainly happened to me. One of them, getting to publish a book on your own language, it’s the dream of every language creator. You can put up all the same information on a web page and most of us have, but there’s just some sort of permanency about a book, about the fact that other people can buy it, that validates it in a way which is just really awesome. It’s something that I wish every language creator could do, and the criterion wasn’t whether it was associated with something that was popular enough to warrant a book being published, but that the language was good enough and complete enough to just be published on its own. That would be a wonderful reality to live in. We’re not quite there yet. Maybe we’ll get there. Other dreams would be to see your language used in some sort of major work of art, like a television show, hearing people speak it, which, again, is something that I’ve had. It just blows me away that this has happened. And then another is to have somebody start to pick up and learn your language, which has happened with mine but has also happened with a ton of other language creators, like Jim Hopkins. It’s just amazing to me. Certainly Tony Harris is not as fluent in Idlani as Jim is, but he’s fluent enough, and that’s pretty amazing to me. And then, beyond that, I think it would be really cool to produce a piece of original literature or original song in one of your created languages. And certainly other conlangers have done that. I think it would be awesome to produce a book-length work. In my mind, one of the most appropriate forms is the epic, whether done in prose or in verse. I think to be able to produce something like that, your original idea, totally in your own language, as a complete whole, that to me would be one of the greatest achievements. Is it more fun to create a conlang, a language from scratch, or to create a fictional language like Dothraki, in which you’re working from a few pieces and you have to create the whole puzzle? I don’t know if one is more fun than the other. They’re different challenges, certainly. When you’re doing your own thing, and you can absolutely create everything, it’s definitely a lot of fun because you can make all the decisions and really do whatever you want with the language. But when you’re working with somebody else’s people, in a shared space, it’s a different kind of fun because it’s half language creation and half exploration and investigation. Trying to figure out what it is that this person has created, what it means for these people to exist, and as you’re starting to build a language, figuring out what those people must be like in their day-to-day lives, and you’re also going to be creating bits of that culture. Provided that you like and are interested in the people that you’re creating the language for, it can be fun. In the book, you mention philosophical languages, which are designed to simplify. And then you have people like J.R.R. Tolkien creating artlangs22“…a conlang created for aesthetic, fictional, or otherwise artistic purposes.”, almost saying, ‘I’m creating a world where the expression goes beyond what I can do with the English language even though I’m a writer, and so I need something that’s more complex.’ Does that feel like a continuum to you? I think there’s definitely a continuum. I think that’s the best way to understand both language and created languages, is that there’s a continuum there. I do think that the approaches are different. Because the goals are different, it changes how you evaluate the language, how you look at it, how you interact with it. And I find a lot of the philosophical languages or the engineered languages to be very fascinating for reasons that are entirely different from the artistic languages that I also admire. There are different things you have to worry about, and then there are other things that you don’t have to worry about. And so it’s cool when you’re working with an engineered language and you have a very specific structural goal, and the question is, how possibly can you achieve this goal? And you don’t have to worry about the history of the language, or who the speakers are and what their culture is, or what metaphors they have in the language. You can basically throw all of that out, and ignore it, just assume basically that the culture of this language is just your own, and it’s present day, and you’re trying to figure out this problem, and so you can ignore every aspect of the language except for the purely linguistic and semantic aspects of the language. Honestly, it can be refreshing. Just as sometimes, after listening to hours of classical music, it’s fun to just throw on a pop song. And vice versa. They’re two different types of things that have two different focuses. And so, for somebody like me, I enjoy working with both at different times, so that I don’t get full on one or the other. I know that there are definitely different types of conlangers, some will only do the naturalistic or artistic languages, and some will only do the philosophical languages. But I’ve never been one of those types. It’s the same type of thing as people who will only read one type of book, or listen to one type of music, just different ways of interacting with art. Do you think that studying or attempting language creation can make someone a better writer in their own natural language? It’s funny, there was a professor of English at the University of Chicago who thought precisely that. So this English professor who was not a language creator himself, and I don’t even know what background in linguistics he had, decided that the only way for freshman to learn how to write was to create their own language. So his freshman composition English class, he had them over the course of a semester create a language. He thought that was the best way to understand grammar. I’m not necessarily sure I 100% agree with his approach but it’s great when there are people creating languages! But I will say that after you’ve created languages for a while, you definitely have a different understanding of grammar, from what you did before. It’s not something that’s buried beneath the surface and unconscious that you simply use without knowing and without really understanding, which I think is the way that we all start out with our own languages. It becomes harder to ignore or not recognize precisely what’s going on in your own language as you’re saying it whether it comes to, talking specifically about English, preposition choice when it’s tied to verbs, the verb-preposition pairings, whether the preposition can come before or after the object. The distinction between who and whom. This is no longer alien to you. You get what’s going on. I think, vis a vis writing, it’s bound to at least give you more options so that you know exactly what’s going on and how to manipulate it. Whether that ultimately improves your writing or impairs you because you become paralyzed and see all the grammar like the Matrix, it’s up to you. You write that you’ve created The Art of Language Invention as a guide for the conlang community, as a way for these skills to live on somewhere beyond the internet. Is this book a first entry in an attempt to make conlanging more academic? I’m not sure I would say more academic. I will say that when this issue is raised, there’s actually a long and tortured history within the community and within linguistics when it comes to the academics of conlang. And that’s like an entire hornet’s nest. But I will say that if there’s a place for literary criticism within academia, then there’s probably a place for conlang criticism within academia. If there’s a place for music performance, and a place for painting, within academia, then there probably is a place for conlanging as well. In the past, part of the negative reaction that we would encounter from linguistics was the idea that we wanted to study conlangs in place of natural languages, the idea being that we could gain insights about language just from studying conlangs and creating them. It’s not really the same. Creating a conlang is basically engaging in an art form, and so what I would look for is not talking about linguistic analysis of conlangs to gain insight about language or anything, but analysis of these languages as artistic wholes, saying, what choices did the creator make in order to achieve a particular effect, which is something that is, in a way, more subjective, but at the same time has a long tradition within other art forms such as music and painting and writing. I’m not sure every single language creator would agree, but that I think would be an academic goal to aspire to. We’re not trying to take over linguistics, just find a way that the art form itself could be appreciated and studied. You talk about how the encouraging nature of the conlanging community is great on the one hand, but it also has meant that things maybe haven’t developed as quickly as they should. Do you think creating that criticism, or maybe just calling it analysis, could help the discipline to grow? I think it’s a necessary evil, as it were. I know that there will definitely be strong reactions to that idea. There have been others within the community that tried to call for, essentially, conlang criticism and it’s just been an uphill fight. I think that’s the place we need to go. There needs to be a cache of reviewers who have a good enough understanding of language, a good enough understanding of linguistics, and also an artistic sense, to be able to analyze a language and put up reviews on it. If you want to start with something, start with the ones that are in television shows. If they’re out there in the public like that, as opposed to, say, somebody just putting it up on their personal website, I think they’re fair game. People who will take things like my languages from Defiance, or the Na’vi language from Avatar, or Klingon, or Tolkien’s languages, languages that are famous from creators that have passed, and analyze them and review them, and give their subjective opinion on them, and get those out there. If somebody takes one of my languages from a show, and tears it apart, then fine! (Laughs) It’s out there in the public, it’s fair game. But it’s something. Somebody is saying something. I think that eventually that’s going to be where we need to get, if we’re going to move in this direction at all. As a layperson, most people’s touchstone for created language is fiction: science fiction or fantasy fiction. Why do you think language creation has thrived in that realm? Do you think that will continue? Do you think there are other genres in which conlangs could start to have a similar impact? Language creation has always seemed to live, depending on the era, in one place or another. It started off as a purely religious thing, and then in the 17th century it was all about philosophy, so it was everybody trying to design the perfect language that would describe all of human experience and the entire world. [Laughs] Yeah, right. And then in the 19th century, it was all about creating a tool. It was a tool for international communication. So I think what happened in the twentieth century is that, I’m not sure if Tolkien started it but he raised it to its highest point very early on. The idea of having a language is that the way we view language is basically a tool, especially one’s own language, one doesn’t really think about it often, it’s just something that you use in order to communicate. And so within fantasy and sci fi, what you get is a realm or a world that licenses a language. So, if you talk about creating a language and somebody says, what use is that? You’re creating a language that nobody speaks. Within a fictional realm, you’re creating fictional people that license the existence of this language. So it’s an obvious application for language creation. And furthermore, it allows for a type of language creation that makes sense, makes artistic sense, makes fictional sense, that doesn’t make sense necessarily in the real world. If you were literally creating a language for people to speak, if it wasn’t going to be based on one of the many languages that exist on earth, and was going to be totally a priori, totally new, why would you go through the process of creating a history for it, like a fictional history and irregularities? How would that even make sense? The fictional history is who? If the only purpose for this language is for you to use it in real life, in real time, in the present, it not only seems like a needless exercise for something like that, but counterproductive, as it will probably be harder to learn than something that was regular, and didn’t require you to learn history or anything like that. With any fictional reality though, that licenses all of this extra work and makes it not a chore but actually a feature, just as authentic costumes and authentic sets are a feature of a production. It helps to really make that fictional world real. That’s part of what, as humans, we do for fun. We indulge in fictional realities as a form of release, and as a form of artistic expression, and we’ve been doing it since the dawn of time. And now with language creation, we just have another tool to shape that fictional reality. Every night she celebrates by drinking fermented galaxies.